Do You Have Type Two Depression? 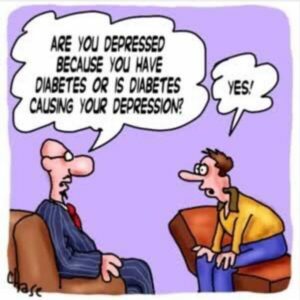 ARE YOU DEPRESSED BECAUSE YOU HAVE DIABETES OR IS DIABETES CAUSING YOUR DEPRESSION? As funny as it sounds this is a good question, and the answer is definitely YES! 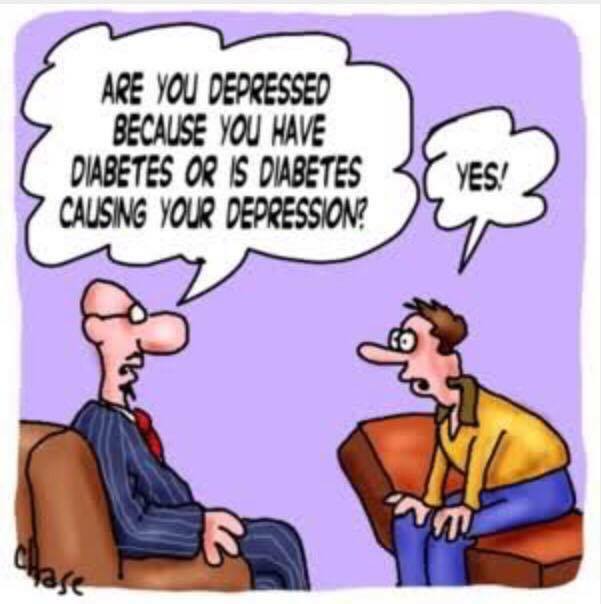 However you look at it, having diabetes can cause depression. Psychologically and biologically, these things aren’t really separate. But what they do not mention here is that the opposite is also true. Having depression can cause diabetes. If you look closely at the physiological conditions encouraging the onset of ‘diabetes’ – and the mood disorders (including depression) – you’ll see that these issues are varying expressions of the same basic underlying causes. It cannot be otherwise. In order to understand the ‘illnesses’ which result from interference with metabolic function, it’s helpful to look at the ways stress of different kinds damages energy systems, causing the progression of a wide range of symptoms associated with the disease states mentioned. But what is metabolic stress? There’s no limit to the number of things which can be the cause of metabolic or biological stress, but one way to view the concept is to see it as anything which places a demand on an organism, where the energy required to respond optimally to that demand, is insufficiently available. The body then attempts to deal with the situation with a variety of biochemical, metabolic reactions – to ensure survival – which often lead to the suppression of metabolism and the promotion of inflammation, degeneration and disease. Some things which can cause metabolic stress include: hardship and emotional distress; extreme or excessive physical demands; environmental poisons and toxins; changes in light conditions, temperature or altitude; as well as malnutrition, starvation or a lack of provision of sufficient or appropriate fuel. Energy supply, thyroid, stress and disease. The things that get in the way of proper thyroid function and impede mitochondrial energy production (or respiration), increase exposure to a number of stress substances, shown to be involved in the promotion of inflammation and the progression of disease, including diabetes and depression. When demand upon the body goes up, blood sugar (glycogen) stores get used up at a faster rate. As soon as glycogen runs low – in some ways the beginnings of metabolic stress – cortisol and adrenalin (and other stress related substances), rise as part of an ’emergency’ survival response. Although this also happens as a normal response to stress, it is central to the blood sugar irregularities connected with diabetes and depression. An important role of cortisol is the maintenance of blood sugar levels via conversion of muscle into fuel for the cells, but when factors exist making this more of a chronic situation with consistently increased stress hormones, problems begin to arise. Increased adrenalin leads to the release of fat from storage into the bloodstream, in the form of free fatty acids to be used as an alternative fuel source. The more fat circulating in the blood, the more insulin function is interfered with, and the less effectively sugar can be used by cells for energy. Interestingly, not only is high cortisol and adrenalin directly connected to the promotion of insulin resistance and diabetes symptoms in general (including muscle wasting and rapid weight loss), it is also an important part of the process of metabolic suppression, which can express itself in the form of a reduction in body temperature, increased fat deposition, and depression. One thing often ignored, is that when fat stored in tissue – and released into the blood under stress – is polyunsaturated, this powerfully promotes inflammation (and rising levels of the stress substances), and turns insulin resistance and mitochondrial function impairment into a potentially chronic issue. Despite the fact that blood sugar dysregulation is commonly thought of when discussing symptoms related to diabetes, it is rare for it to be brought up as an important issue in the treatment of the mood disorders, including depression. This is despite the fact that many studies show that stress hormone release – and increasing circulation of polyunsaturated fats – directly impacts upon proper blood sugar regulation, promoting the development of inflammatory states, including symptoms of diabetes and mood instability. Digestive function a key to stress and metabolic suppression. When thyroid and energy system metabolism is interfered with, proper digestive performance as a whole tends to slow, and this allows for bacteria to feed and grow in number at a much faster rate than is optimal. As bacteria increase in quantity and move further up the intestine, they interfere with digestion and release greater amounts of toxic byproducts – such as endotoxin (LPS) – which can then promote an increase in levels of inflammatory and stress related substances, such as serotonin and estrogen. Even though it is well known and understood that emotional distress has an immediate effect upon digestion, it is uncommon to see treatment approaches to depression taking into account bacterial endotoxin related issues, and equally uncommon to see a consideration of how factors related to this, impact upon proper blood sugar regulation. These relationships are often ignored regardless of the fact that there is a large body of experimental evidence which continues to confirm the direct connection – in many ways causative – between endotoxin, blood sugar dysregulation and suppression of mitochondrial energy systems, and possibly every inflammatory stress condition or illness, in particular obesity, cardiovascular disease and diabetes. On top of this, rising levels of the stress substances – such as estrogen and serotonin – which go up alongside increasing bacterial issues, have been demonstrated to play a significant role in the promotion of symptoms of diabetes and the mood disorders including depression. Suppressed metabolism in combination with bacterial excess – and increased endotoxin, serotonin and estrogen in the intestine – increases the stress placed upon the liver, overloading it with toxins (further reducing thyroid function), allowing the pro-inflammatory stress substances to pass through into the main system. Once there, they promote further inflammation and the release of the polyunsaturated fats out of storage, all then powerfully interacting to escalate issues of insulin resistance and excessive cortisol release, and generally promoting conditions of metabolic stress which result in depression or diabetes or both. Interruption of this kind of stress cycle can be achieved by improving the provision of fuel for energy in the face of increased demand, avoiding (where possible) interference with digestion, and attempting to stabilise blood sugar supply. If and when this lowers stress substance release – minimizing free fatty acids and bacterial issues – thyroid function can improve, and symptoms can have the chance to abate. In many ways, this is the definition of a healthier metabolism. One approach includes a diet removing the polyunsaturated fats, and restricting hard to digest fibrous and starchy grains, nuts, seeds and under cooked vegetables, whilst including sufficient protein – from milk, cheese and gelatinous cuts of meat – and plenty of easy to digest simple carbohydrates – from fruit, juice, white sugar and honey. Other things shown to be useful include coffee or caffeine, aspirin, niacinamide, a variety serotonin, estrogen and cortisol inhibiting substances (such as cyproheptadine and other things linked to below), as well as some things which help remove digestive toxins, such as raw carrots, very well cooked mushrooms, activated charcoal and certain antibiotics. Many still look at depression and diabetes as if they were unrelated issues which sometimes have factors in common, and may or may not occur at the same time…but not for any explainable reason. Often the treatments for diabetes have ‘side-effects’ that worsen symptoms of depression and vice versa. This is a big problem, especially once you have accepted that the symptoms of degeneration and disease have deeply connected underlying causes. Can it ever be appropriate to treat them with contradictory approaches, improving one at the expense of another? Estrogen-mediated effects on depression and memory formation in females. Beneficial effect of aspirin against interferon-α-2b-induced depressive behavior in Sprague Dawley rats. Polyunsaturated fatty acid-mediated suppression of insulin-dependent gene expression of lipogenic enzymes in rat liver. The cortisol response to clonidine in acute and remitted depressed men. Mice genetically depleted of brain serotonin do not display a depression-like behavioral phenotype. Association between mental disorders and physical diseases in adolescents from a nationally representative cohort. Nicotinamide protected first-phase insulin response (FPIR) and prevented clinical disease in first-degree relatives of type-1 diabetics. ‘Leaky Gut’ & The Stress Matrix.